Las Vegas casinos gaming revenue was a cool $949 million during June, 2008. Year to date total was a 1.1 percent deficit for Nevada casinos. This is the longest decline since the terrorist attacks on September 11, 2001. During that time there was only a five month decline in casino gaming revenue. The fiscal year for Nevada ended in June and tabulated $12.5 billion in gaming revenue. This was the first fiscal year decline in six years at 1.87 percent. The previous month’s unprecedented decline was 15.2 percent and the casino owners were grateful the decline for June wasn’t worse. What’s come along with visitors spending less are higher expenses for the same visitor in the past. 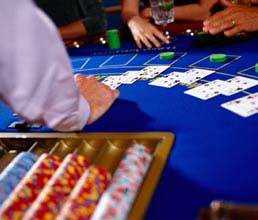 Gaming Control Board took in an increase of 8.4 percent casino gaming taxes. The taxes paid by casinos include a 6.75 percent tax on paid markers by gamblers. The Strip’s gambling revenue in casinos was down for the fiscal year 1.5 percent. June had a decrease of three percent to $486.4 million. Northern Nevada gaming revenue had a horrible decline of 19 percent to $75.3 million. Washoe County posted 12 consecutive months of decline for Reno casinos. Downtown Las Vegas and Boulder Strip casinos posted a gambling win for June up 10 and 25 percent, respectively. Possibly due to slot machine revenues posted a month later than expected. Call 702-505-6988 for VIP real estate representation by a real estate agent. Las Vegas casinos gaming revenue was a cool $949 million in June.